I have a thing about luggage. From carry-on to hold luggage from backpacks and wheeled duffels to hard-shell suitcases and day packs. I have a cupboard full of packs within, wheelie bags within duffels within suitcases. The luggage version of Russian dolls. I’m on a constant quest for quality luggage that makes travel easier and when it comes to carry-on luggage I think I’ve found ‘the one’. 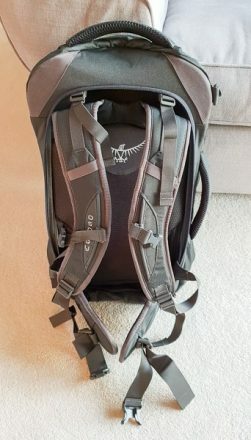 I’ve been testing out the Farpoint 40 Osprey Rucksack and I absolutely love it. Small but not too small, this perfectly sized pack has room for all my gear and conforms to EU maximum carry-on luggage size. I’m actually feeling rather smug about this backpack. Why travel with carry-on luggage? I prefer to travel with just carry-on luggage for so many reasons. You’re less likely to lose it, there’s no waiting for baggage to arrive at the carousel and the additional cost of checking in hold luggage on some of the ‘budget airlines’ is ridiculous. 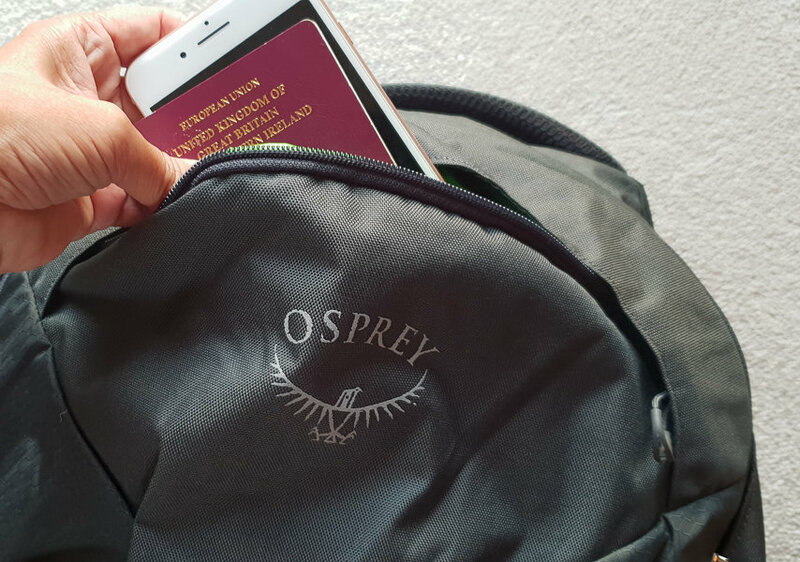 The Osprey Farpoint 40 is suitable for many budget airlines but you must always check on the airline website to be sure. 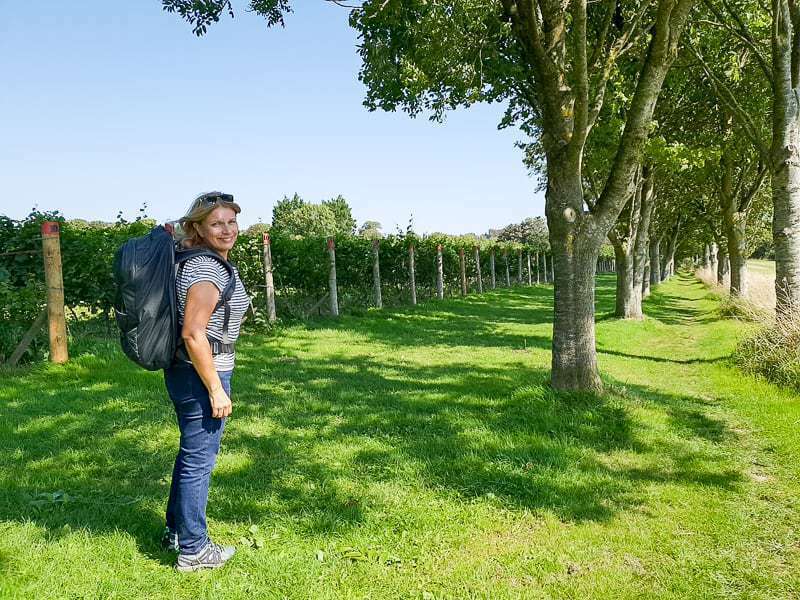 Ryan Air recently reduced its carry on dimensions to a ridiculously small 40cm x 20cm x 25cm so this rucksack is too big for their carry-on rules. 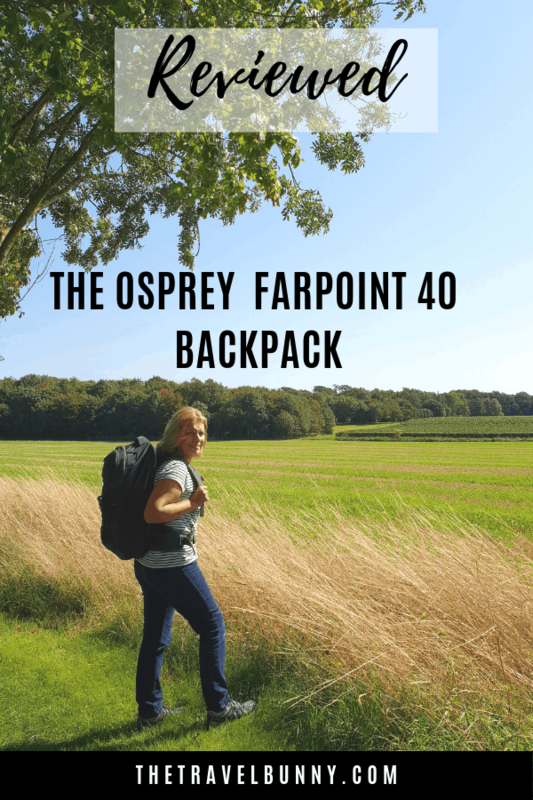 Let me explain why I think the Osprey Farpoint 40 Rucksack ticks all the boxes. 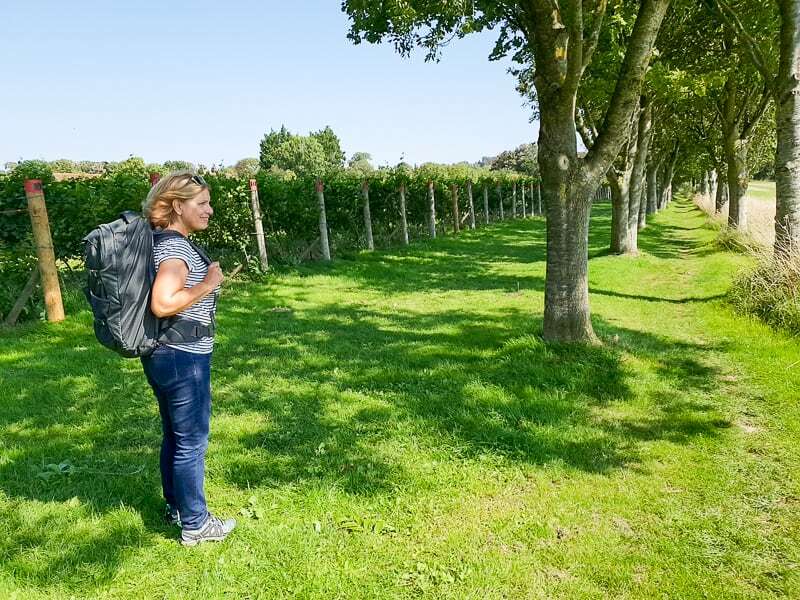 Osprey have been designing and making rucksacks for over 40 years. Fit, durability and comfort are at the foundation of their design along with good quality. You can see this and you can feel it. 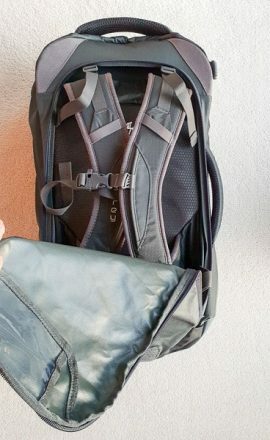 It’s probably why the Farpoint and Fairview ranges are among some of the best-selling backpacks. I’m only 5’2” so I don’t want to lug around a huge pack. I’m not getting any younger either. The Farpoint 40 comes in two sizes; small/medium for people under 5’6” (38 litre) and medium/large for over 5’6” (40 litre). 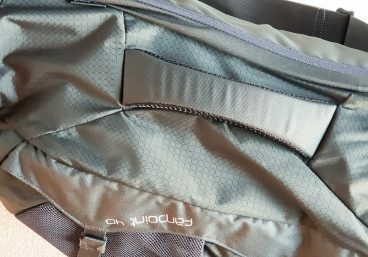 I’ve got the S/M and the choice of fit means this is the most comfortable backpack I’ve used. Unpacked it weighs just 3.11 lbs. Use the table below to check whether the Farpoint 40 is compliant as carry on for your airline. The Farpoint 40 is carry-on compliant for most low-cost airlines but big enough to pack everything you’ll need. Savvy packers could go for months with this pack. Internal and external compression straps mean everything is neatly secured. The internal frame is lightweight and well-padded hip and shoulder straps mean that weight is distributed evenly and comfortably. Much of the weight is taken on the hips which helps prevent back strain. There’s even an emergency whistle incorporated into the sternum strap and elastic strips on the shoulders to attach clip-on items. The devil’s in the detail. I love the way the shoulder straps and hip belt stow away into a zipped back panel when you’re not in backpack mode. This means there are no dangling straps to step on and the bag looks neat and compact. 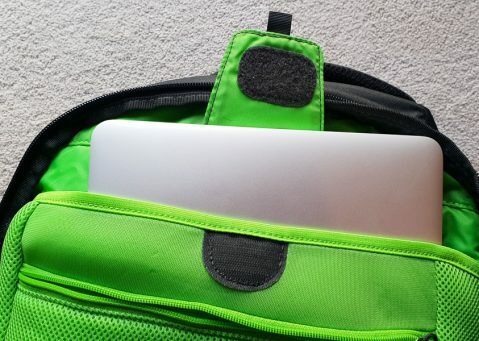 When in back pack mode the back panel tucks neatly away and is held in place with velcro. There’s a detachable padded shoulder strap which is great for hopping on and off trains, buses and in airports. 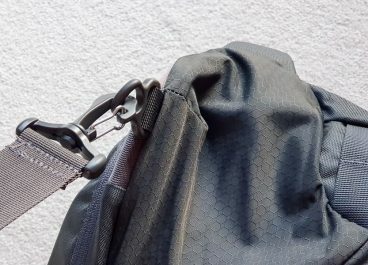 Padded side and top grab handles mean there are two further carrying options. The quality is obvious from the look and feel of the bag. It’s made from 210D Nylon mini Hex Diamond Ripstop. 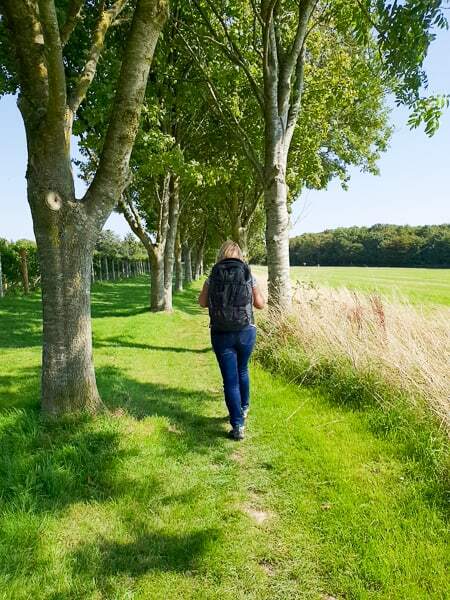 Osprey Rucksacks are built to last and come with Osprey’s ‘All Mighty Guarantee’ as part of their commitment to protect the environment. 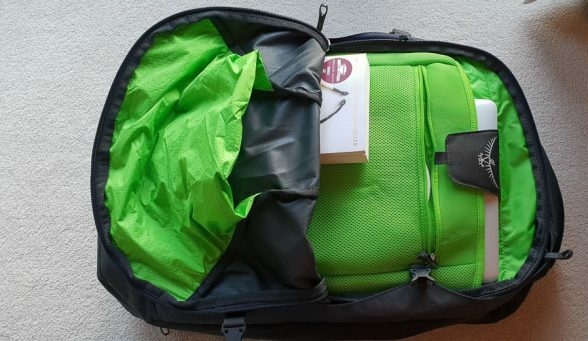 The Farpoint unzips on three sides like a suitcase which means it’s easy to take things out without having to unpack the entire contents. 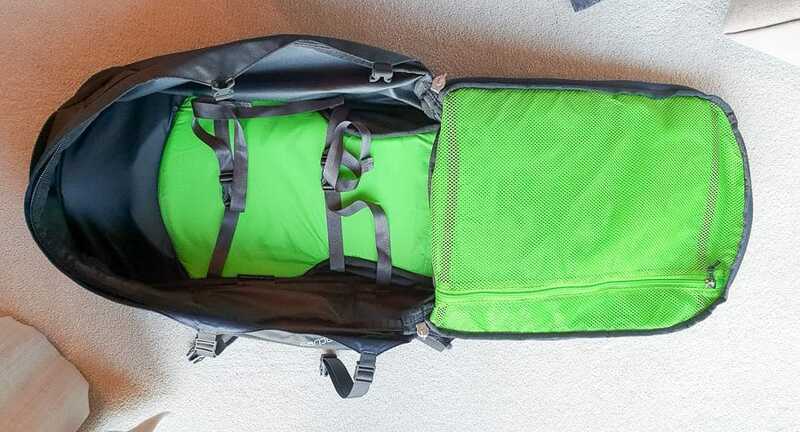 Even easier using packing cubes. The main compartment is roomy and has dual compression straps and a large zipped mesh pocket. 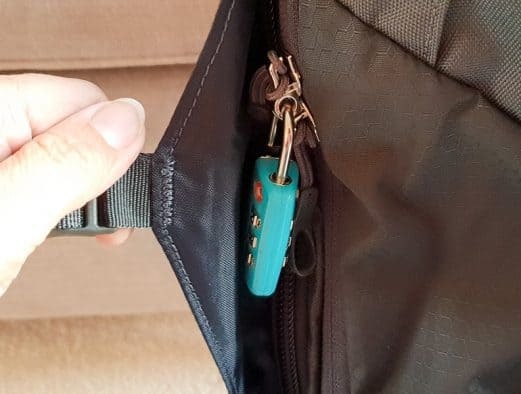 The zippers are lockable (lock not supplied) and the whole of the zip tucks away so it’s invisible to light fingered types. A smaller hidden pocket at the top is good for storing valuables. 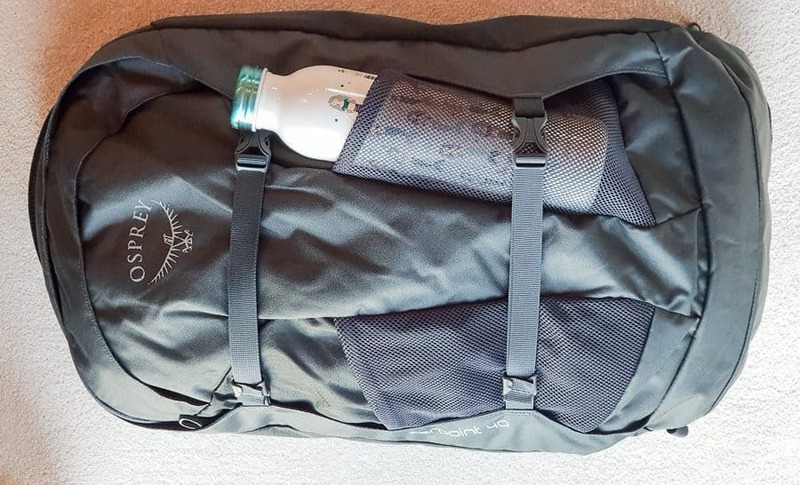 On the outside are two mesh pockets suitable for water bottle if the bag isn’t too full. These are also good for hooking things to. Two outside compression straps keep the bag neat. Narrower than the main compartment there’s a padded section for storing a laptop, another padded section for a tablet and a third zipped mesh section which I use for cables, chargers and tech gear. 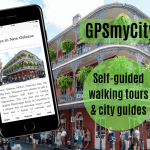 Perfect for blog trips. The Farpoint comes in two colours, jasper red and volcanic grey and is currently on sale at Simply Hike for £79.99 (usually £100). If you’re after a bigger pack there’s a 55 litre and 70 litre versions although these aren’t carry on compliant. 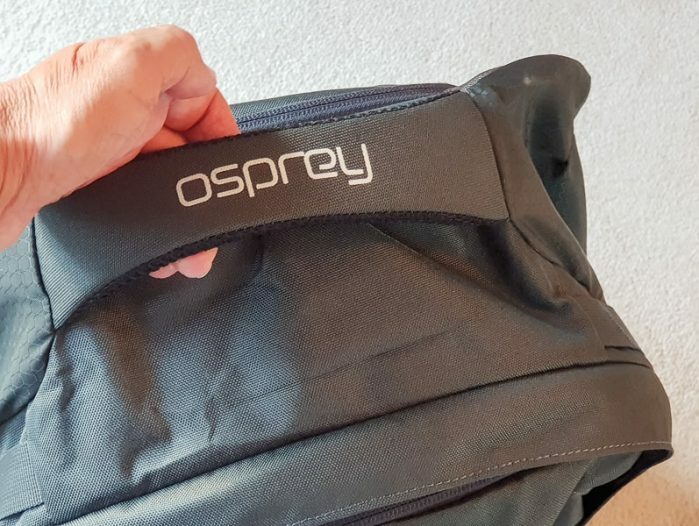 Osprey are dedicated to protecting the environment and design quality products built to last a long time. Their All Mighty Guarantee says they’ll fix or replace any of their products however old they are. They must be pretty sure of the quality to make this promise. 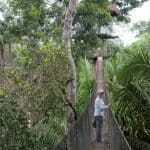 Osprey don’t over-produce only to sell at discount prices. Quality materials are used and wastage is kept to a minimum. 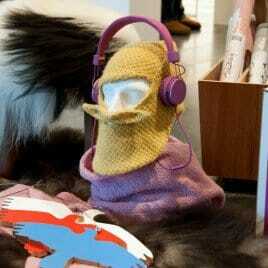 The product is not fashion driven so customers are not encouraged to replace bags before they’re worn out. Packaging is kept to a minimum and is recyclable. I’d love to say this is the perfect pack but there are a couple of points. 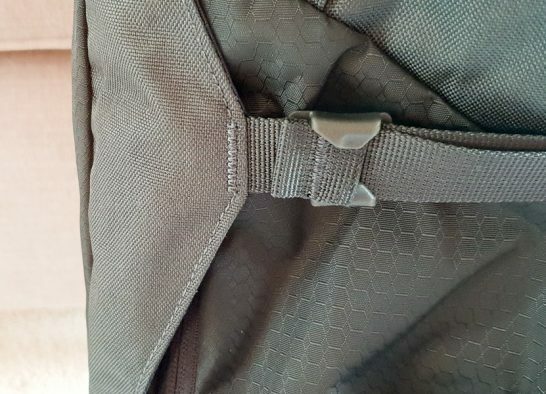 When the back is totally full there’s no way I could get my water bottle in the mesh pocket at the back. Maybe I could get a clip and hang it but it’s a good bottle and part of my effort to reduce plastic usage so I don’t want to replace it. Also it would be handy to have small zipped pockets on the hip straps for money, credit card, keys etc. We’ve been on a few trips now and we get on really well. 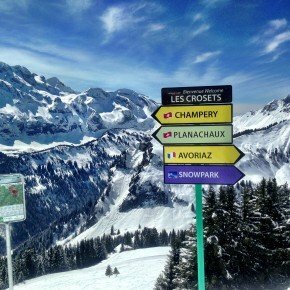 In fact it’s a winner and I can’t wait for our next trip together! I love the design, quality, durability and practical features. 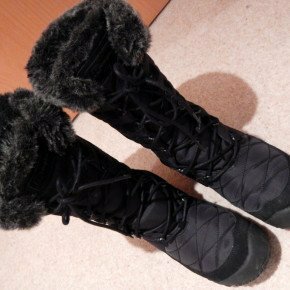 It’s light but tough, really comfortable to wear, has plenty of space and is cabin compliant. I love this backpack and am pretty sure it’s going to be my travelling companion for life. I think Mr Jones needs one too. 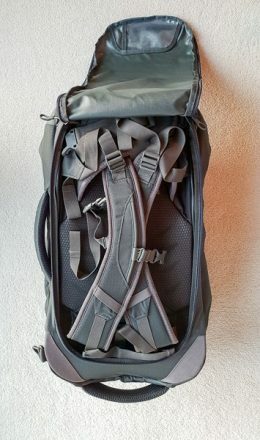 The Farpoint 40 was gifted to me for the purpose of this review by Simply Hike. All thoughts, views and opinions are entirely my own. Some of the posts on this site contain affiliate links and As an Amazon Associate I earn from qualifying purchases. If you buy an item via this site I receive a small commission at no extra cost to you. 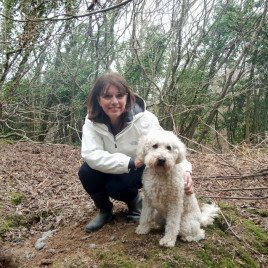 If you choose to buy anything it’s very much appreciated, thank you. Ryanair now has new rools about free carry-on bag: 40x20x25cm. 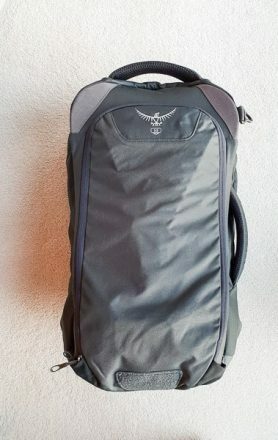 How to make my Osprey Farpoint 40 to this size? Ryan Air have changed the rules since I wrote this review. They now state “All passengers are entitled to bring 1 small personal bag on board which must fit under the seat in front of you (40cm x 20cm x 25cm). Examples include, handbag, laptop bag and small backpack.” However you can get around this buy purchasing “Priority & 2 Cabin Bags”. This way you can bring 1 additional 10kg bag on board which must fit into the baggage sizer (not exceeding 10kg and dimensions 55cm x 40cm x 20cm). The cost is (Nov 18) £6 at time of booking or £8 post booking. However, the Farpoint 40 is the following dimensions 54(L) x 35(W) x 23(D) so the depth is 3cm too big for the Priority & 2 Cabin Bags. I absolutely love how small this backpack is Suzanne. Brilliant. It’s the perfect size for me! I’ve never owned a backpack, but if I was to get one, it looks like this would be the one! I read that about Ryanair; so upsetting! Soon we’ll just be able to board with a wallet or passport holder; it’s getting so ridiculous. I love that the Farpoint 40 is complaint for carry on, even on Ryanair. One of my issues is getting something that works in the UK, size wise as your numbers are even smaller than ours. Thanks for this review; good information! So with the “priority and 2 bags cabin” the farpoint 40 fits on 55x40x20? Or not? Thanks in advance and for your post. Hi Ferran, The Farpoint 40 measures 54(L) x 35(W) x 23(D) – I’ve added a size chart to the post to help with this.